Hi loves! Are you ready for the Valentine's day? Personally I don't make a big deal out of it though this post is kind of inspired by the day. Do you celebrate Valentine's day? Either you love it or hate it I just wish you a lovely day! In love love with the colour scheme in the pictures. Might sound weird haha. Anyways, great post you got yourself a new follower! I don't make a big deal of Valentines day either. This is such a cute post, everything is so pretty! I would be happy to receive any of these gifts but I love the Creed Soy Candle. Looks so lovely! I really really love your blog design, such a good work! 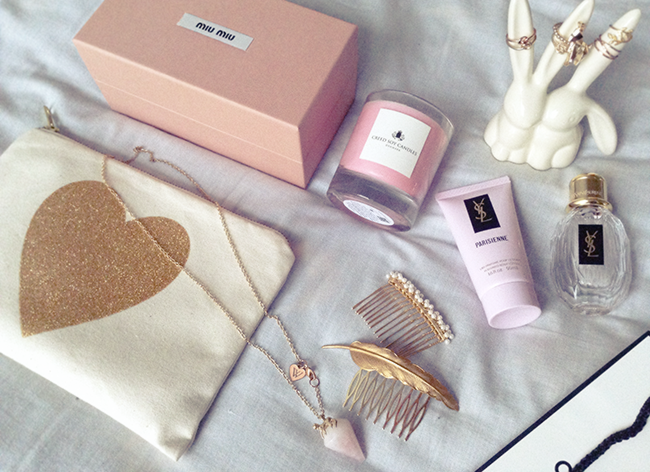 Such a pretty pink post. So feminine and chic. I'm obsessing over that necklace! also the ring holder is adorable! That little purse is so cute! I love this all together - the miu mii box - is it sunnies? Id love to see them, I'm thinking about the cat eye black pair. would you like to check my blog? Maybe we can follow each other? great pictures. We don't make a big deal out of v-day here. Me he enamorado del bolsito con el corazon y de tu blog, te sigo desde ya, espero que tu tambien. The cat eye mask is so cute! Great blog:) Following you now! Aw, your blog is so pretty! Glad to find you, I've just followed you back. Lovely items! You have such a beautiful blog. Thank you so much for joining my followers, so I could find it ! x I've saved you on top of my watch list :) I hope you stop by at my blog some day, too. I like the cat eye mask. And the necklace is cute too. I love your hair combs <3 Your blog is just amazing, dear. :) I am your new follower by GFC now. You can follow me too if you like. Can I just say, your blog is so pretty! I love the layout and style of it :) and so funny, I have the same bunny ring holder - so useful! 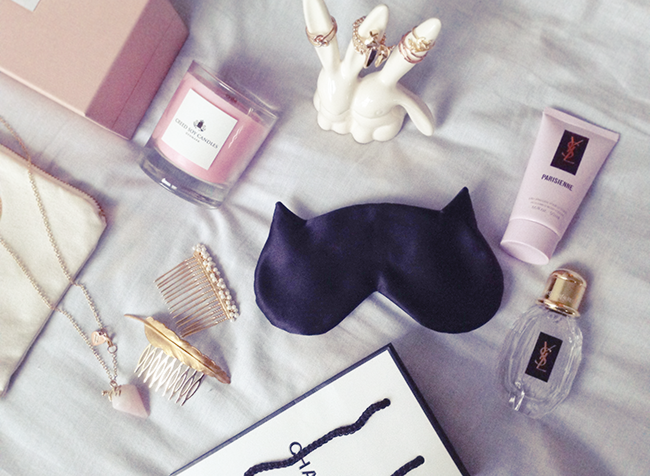 These items are so perfect for Valentine's day. Thank you for following me, I am following you too ! You have the most gorgeous blog! Love the header and love these photos. Hope you have a happy Valentine's, whatever you may be up to! Love the feather hair comb + necklace. Its all just too cute! Cute pictures! I love the feather hair pin especially. You have a beauuuuutiful blog!!! I love all of your posts. All of this pink is so lovely! Happy Valentine's Day! Have a good one! Pink is too good i love it all thanks for share it. My favorite color. I followed you now and hope you visit mine to follow me,too. You have an amazing blog, I especially love your photography. Would you like to follow each other on gfc and bloglovin?Just let me know on my blog! 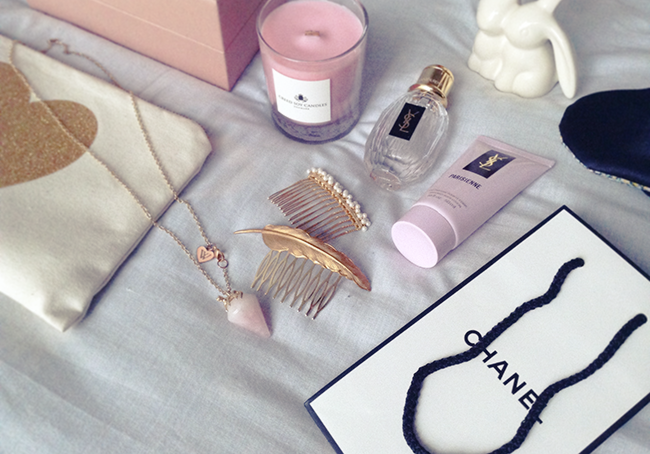 aww in love with all theses pretty things♥ I want it!!!!!!! I found your blog today... I love your posts! 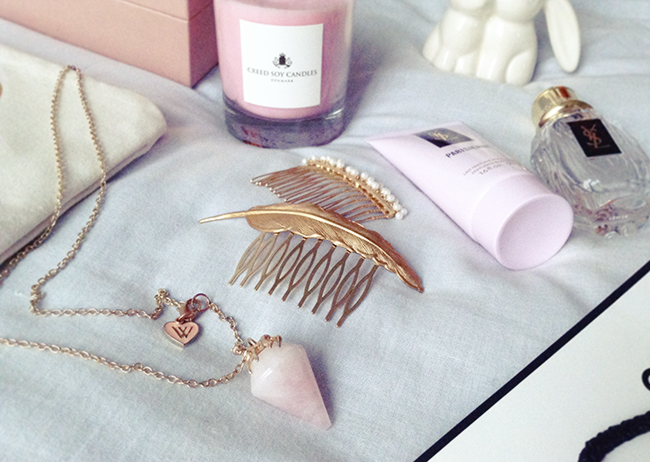 Great selection of delicate pink items... I love the YSL perfume... I'm following you via CGF now... if you wish to follow back. Thanks a lot! Amazing blog :) I'm already following you back! These pictures are absolutely beautiful! Beautiful items! Have a lovely Valentine's Day! Thank you lovely for your comment on my blog. I love your blog, this is the way that I would like to have mine! such a cool atmosphere here, pink is my favorite color! This is such a beautiful post, I love all of your photos! hi dear! thank you so much for visiting my blog. Your is awesome! now i follow you too on gfc and Fb. following you now dear! i love the whole collections!! Hi Great post! Thank you so much for choosing my Pearl hair comb. The photos came out beautiful lots of style - Just love it!!! You have such cute photographs! I love your photography style (does that make sense?!) What I'm trying to say is that I love how pink-y, cute, lovely & delicate they are! Anyways, that cat mask is adorable!